Summer is the perfect time to host an outdoor party. Keep in mind, an outdoor party does not require an official event. Life is short; celebrate it. Yes, celebrating a birthday or special occasion outdoors would be the great way to spend a summer day. At the same time, gathering friends or family members over just to celebrate summer is another great way to spend an afternoon. Begin with preplanning to help reduce the stress of hosting a party. By taking the time to write down notes and ideas, you will find hosting an outdoor party an easier task. Consider purchasing a spiral bound notebook to hold all your party planning information. Notebooks are inexpensive. Keeping all the details in one location will be extremely helpful. Planning the party should begin with a guest list. In your notebook, write down all the guests’ names. The number of people on your guest list will help determine the amount of food and beverages to purchase. The list will also provide you with a general idea of the size of your outdoor party. Sending out invitations is a vital component for hosting an outdoor party. In today’s technological era, you actually have options in sending out invites. Traditional Invites: Contrary to popular belief, not everyone is on social media. Traditional invites may be sent through postal mail to guarantee the potential guest receives the invitations. Create an Event Page: On Facebook, you have the option to create an event. The process is simple. You will be able to send out invites to multiple guests at one time. As you get closer to the day of the party, you will be able to use the Facebook event page to determine the number of people attending your outdoor party. Planning a detailed menu is essential for hosting an outdoor party. Menu planning ensures your outdoor party has a variety of food. Type of Food: Consider a themed or potluck approach to the menu. Often, your guests will be more than happy to bring a dish to pass. Grilling: If you are grilling, ask a friend or family member to be in charge of the grill. Use safety precautions in handling raw meat to eliminate the chances of cross contamination. Beverages: As you plan the food, remember to add the beverages to the list. Provide the basics including tea, lemonade, and water. If you want to serve alcoholic beverages, designate a responsible person to serve. Along with the menu, plan other aspects of the party. Games: Outdoor games are a great way to entertain guests. Children Area: If you have children on your list, you may want to design an area just for them. Games, outdoor chalk, bubbles, art area, and other activities will entertain children. Photographer: Hiring a photographer allows you the chance to enjoy your party. A photographer will be able to capture the memories. Under some circumstances, an amateur photographer will photograph the party at a discount to gain the experience. Along with the menu, the party set up area needs planning. Location: Where will you host your outdoor party? The location is important. If you are hosting at a local park, you may need to rent the pavilion in advance. Or if you are using your own backyard, you will need to prepare to accommodate your guests. Table and Chairs: Where will your guest sit? Rental pavilions usually come with picnic tables. For your backyard, you will need to consider the seating arrangements in advance. 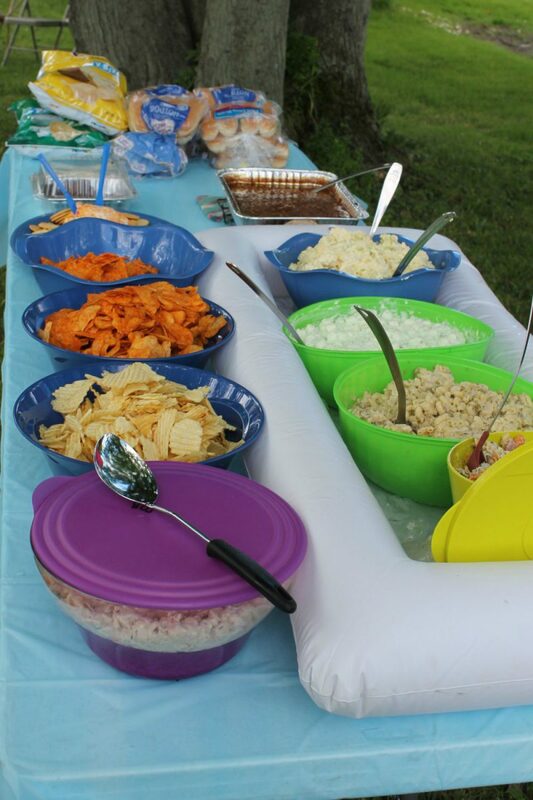 Borrowing or renting picnic tables, tables, and chairs will ensure every guest has a place to sit at your party. Food Area: Where are you going to serve the food? Warmer summer months mean food risks spoilage or contamination. As the host, the last thing you want is your guests becoming ill. Consider using children’s pools or other food holding containers to place colder items in. Pack lots of ice around the cold items to ensure the proper temperatures. If you are grilling, handle raw meat with care. Hosting an outdoor party is supposed to be fun. Do not allow the stress of hosting ruin your day. Consider delegating friends or family members to help. Allow yourself plenty of time to mingle and chat with guests. After the outdoor party is over, cleaning up is the last step. For easy cleanup, provide trash and recycling containers in the party area. Most individuals will abide by the rules and throw items away in the proper area.